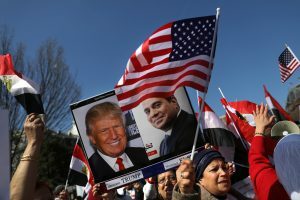 After a divisive presidential campaign brimming with anti-Muslim rhetoric and marked by an “America First” worldview, is President Trump emerging as an ally of America’s traditional Arab partners in the Middle East? Although the potential for policy differences are high, the nexus of American-allied Arab states have largely brushed aside Mr. Trump’s campaign rhetoric and are focusing on the overlapping interests they see between themselves and the new White House, especially the need to contain Iranian influence and crush ISIS. While for Trump’s critics his impulsiveness makes him difficult to read, in several Arab capitals he is being increasingly viewed as a flexible dealmaker whose actions in the region can be shaped to fit their interests. 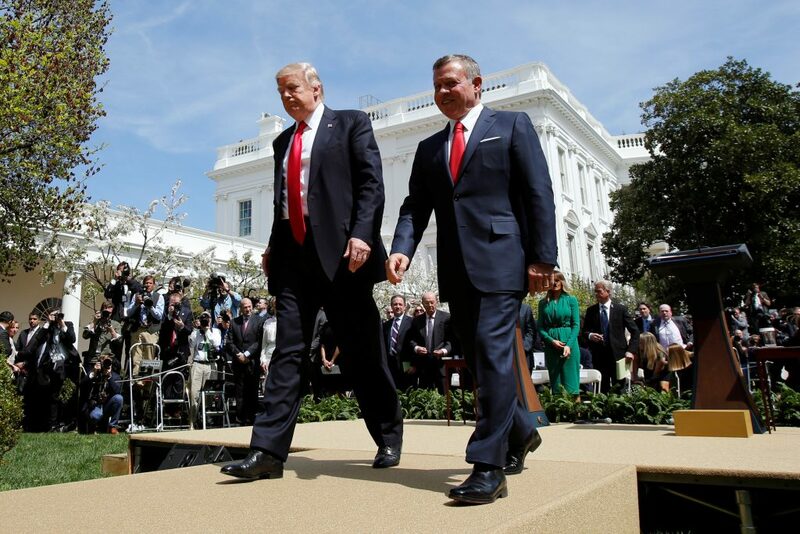 In recent weeks, leaders from Saudi Arabia, Jordan, and Egypt have all visited the White House and left feeling like normal relations had been restored after years of disillusionment with former President Barack Obama. More importantly, the decision by the Trump administration to launch a cruise missile strike in Syria in response to the latest chemical weapons attack is being taken by the governments of the Arab Gulf as the first concrete overture in this rapprochement. In the Arab world, criticism of Trump since the election has largely faded from state-affiliated media and turned into praise, with some pundits even beginning to refer to him as “Abu Ivanka,” an informal term of endearment meaning “father of Ivanka” that denotes a certain familiarity and respect. Talk of the so-called Muslim ban has all but disappeared. At the same time, confidence in the Trump administration has risen due to the increasing prominence of top officials like Secretary of Defense James Mattis and H.R. McMaster, the national security adviser, and the marginalization or exit of polarizing figures like Steve Bannon and Michael Flynn, who once equated Islam to a cancer. Secretary of State Rex Tillerson, the former head of oil major ExxonMobil, has had experience working with the oil producing countries of the Middle East. The early, surface-level excitement with Trump belies a relationship that’s fraught with problems. Yet the early, surface-level excitement with Trump belies a relationship that’s fraught with problems — and that could unravel in the long-term if the sides don’t agree on a host of complex issues. The Syria strike, in particular, marked a sudden and dramatic departure for Trump, who promised as a candidate to reduce America’s exposure overseas and avoid wars in the Middle East. But it also raised numerous questions, given that the Trump administration insisted the strike was a one-off event: If Syrian President Bashar al-Assad continues to bomb civilians — or use chemical weapons in the future — will Trump act again? And if not, what makes his Syria policy all that different from Obama’s? The debate underscored another reality that could pose potential problems for Trump: America’s allies in the Middle East do not speak with one voice and their policy objectives are not identical. Nor is public opinion always in sync with the ruling governments. For example, Saudi Arabia and Jordan have clearly favored the rebels in Syria’s civil war, while Egypt has leaned towards Russia and Iran, who have backed a resolution to the war that keeps Assad in power. Despite pressure from the richer Gulf states, Egypt has also refrained from getting heavily involved with Saudi Arabia and the United Arab Emirates in their war in Yemen against Iranian-backed rebels, though Egypt recently announced plans to increase its military presence there. Moreover, on paper and likely in practice, Trump’s “America first” worldview won’t represent a sharp turn away from his predecessor’s policy of decreasing America’s footprint in the Middle East. While a Trump doctrine on foreign policy has not been fully fleshed out, “the Trump policy in the Middle East is likely to have more continuity than change with the Obama administration, notwithstanding tremendous differences in style and temperament,” said Perry Cammack, a foreign policy specialist at the Carnegie Endowment for International Peace and former policy advisor to former Secretary of State John Kerry. The quick embrace of Trump is a response in many ways to the deep distrust that built up in the Obama era, when America’s traditional Arab allies largely felt abandoned by the U.S. during the Arab Spring in 2011, increasingly frustrated with Obama’s Syria policy, and betrayed by the conclusion of the Iran nuclear deal. The eruption of the Arab Spring reframed America’s relationship with its allies in the Middle East. Obama largely refrained from jumping to the aid of embattled regimes facing off against angry protesters. The fall of Hosni Mubarak in Egypt early on in the Arab Spring set the tone for what came next. The Arab Gulf, led by Saudi Arabia, was shocked that Obama did not intervene to save a longstanding, if authoritarian, friend of the U.S. and allowed Mubarak to be replaced by the Muslim Brotherhood — an Islamist group held in deep suspicion by many governments in the region as well as the U.S. (The group was democratically elected but then overthrown in a military coup in 2013). As the upheaval spread to Syria, Obama’s unwillingness to enforce his own “redline” promise to take action if chemical weapons were used in the conflict heightened many allies’ uncertainty over their own security guarantees from the United States. Finally, the 2015 Iran nuclear deal triggered the Sunni allies’ worst fears: that America might put their security in jeopardy for better relations with the Shi’ite Islamic Republic. By the time Obama left office, America’s allies in the region held “a range of views, all bad, spanning from the U.S. was just checking out on the most benign end, to the U.S. was plotting with Iran against us on the more paranoid end,” Ibish said. “There is no secret that there was kind of an exasperation with President Obama by many of the traditional partners” in the region. To add salt to their wounds, Obama derided the Saudis and their allies as “free riders” and exporters of extremism in an interview with The Atlantic, something they found deeply offensive. “There is no secret that there was kind of an exasperation with President Obama by many of the traditional partners” in the region, said Cammack. On the campaign trail Trump also criticized “free riding” nations in international alliances. But there is a strong belief among the Gulf countries that they don’t fall in that category, given they spend tens of billions of dollars annually on American military arms and invest hundreds of billions in the U.S. economy. As president, Trump has also taken additional steps to demonstrate his commitment in the region. Early on, he declared his intention to move the American embassy in Israel from Tel Aviv to Jerusalem, and appointed David Friedman as his ambassador to Israel, a controversial pick who has openly condemned the two-state solution and given money to Jewish settlements in the West Bank. But since then, Trump has softened his approach, sending Jason Greenblatt — his special envoy for international negotiations — to the Arab League summit in Amman, Jordan last month to seek Arab input on Middle East peace efforts. Greenblatt’s appearance at the summit was a welcome gesture in the region, and a sign of Trump’s eagerness to score a foreign policy win at a time of visible dysfunction inside his White House. Being seen as repairing relations with allies Obama had distanced (namely Israel, Egypt and Saudi Arabia), was an easy place for Trump to start. For the moment, the Arab states are willing to embrace Trump in the hopes of influencing his foreign policy on the issues that matter to them most. But with divergent views on the region, and a political minefield for Trump to navigate back home, the chances of him keeping everyone happy are slim. Omar H. Rahman is a freelance journalist and commentator. His work has appeared in Foreign Policy, the Guardian, and Rolling Stone, among other publications. He holds a Master’s degree in political journalism from Columbia University.